﻿ John F. Kennedy's Famous 1960 "New Frontier Speech"
- Alan Jay Lerner, Camelot; quoted by Jacqueline Bouvier Kennedy to historian Theodore White, November 29, 1963. American citizens today are filled with cynicism and distrust about presidential politics; most young people today assume that all modern presidents have deceived or disappointed the American people. Perhaps it is worth reminding them that it is possible to have a president who is honest, idealistic, and devoted to the best values of this country. It happened at least once - I was there. Presidential speeches hardly come tripping off the communal tongue, but most schoolyard graduates can, at least, recite the most famous lines of three of them. "Fourscore and seven years ago," they know, is the beginning of Lincoln's Gettysburg Address. "The only thing we have to fear is fear itself" is what Franklin D. Roosevelt said, upon assuming the presidency in the midst of the Great Depression. And John F. Kennedy, they'll remember, or have heard, from their parents or even grandparents, spoke seventeen words which instantly became, in American memory, indelible. On his dazzlingly bright 1961 Inauguration Day in Washington D.C., against the backdrop of the Capitol blanketed in fresh snow, the youngest president ever elected challenged his fellow Americans to "Ask not what your country can do for you - ask what you can do for your country." His audience was electrified; people really did, then and there, resolve to work for their country; lives, and careers, were changed forever. But had the packed throngs, the millions upon millions watching the broadcast on television or listening across the world on radio, been paying really close attention, all the back to July 15, 1960, they would have heard that momentous call, before. 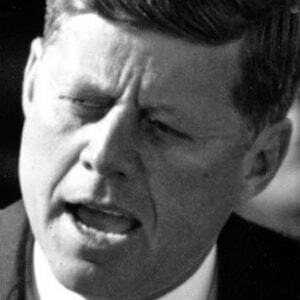 In his Acceptance Speech for the presidential nomination at the National Democratic Convention on July 15, 1960, entitled "The New Frontier", Kennedy sought to define what exactly comprised that catchphrase. He wanted a motto which reflected the tasks and challenges ahead, while invoking a courageous past - and pioneer days, apparently, came to mind (whose mind was, in all likelihood, a combination of JFK's and his speechwriter Pollux, Ted Sorensen.) It was in that connection, then, that Kennedy said from the podium that night in Los Angeles that he now stood "facing west on what was once the last frontier." From the lands that stretch three thousand miles behind me, the pioneers of old gave up their safety, their comfort and sometimes their lives to build a new world here in the West. They were not the captives of their own doubts, the prisoners of their own price tags. They were determined to make that new world strong and free, to overcome its hazards and its hardships, to conquer the enemies that threatened from without and within. Today some would say that those struggles are all over -- that all the horizons have been explored -- that all the battles have been won -- that there is no longer an American frontier. But I trust that no one in this vast assemblage will agree with those sentiments. For the problems are not all solved and the battles are not all won -- and we stand today on the edge of a New Frontier -- the frontier of the 1960's -- a frontier of unknown opportunities and perils -- a frontier of unfulfilled hopes and threats. Wilson's New Freedom, he continued, promised "a new political and economic framework" and Franklin Roosevelt's New Deal promised "security and succor to those in need." But his New Frontier was not a set of promises. It was, instead, a set of challenges. And then he told the world, as he readied to fight for the presidency, what he would give them when he won. The New Frontier... sums up not what I intend to offer the American people, but what I intend to ask of them. It appeals to their pride, not to their pocketbook -- it holds out the promise of more sacrifice instead of more security. that they might master, ultimately, both "the far side of space and the inside of men's minds." Kennedy's most famous words, then, had their origin in this speech announcing the New Frontier which, all too soon, would be tragically mythologized as "Camelot." But if it is best remembered for its soaring poetry, it is also worth remembering that "The New Frontier Speech" was given in the midst of a political campaign, and needed to satisfy specific prosaic concerns. Thus it was crafted to do more, even, than inspire a new generation to public service - but to win over a majority of American voters. Kennedy had, with his Acceptance Speech, to unify his party after a bruising contest; reassure Protestants fearful of his Catholicism; and attract independent and republican voters mistrustful of his "inexperience" and religion. But even then, it was noted - on the Sunday Editorial page of the July 17th New York Times, no less - that Kennedy had taken a new tack in this speech. One person, at least, heard the opening bars, as it were, of the siren-song of Camelot. "Kennedy supported the platform, of course, but his tone was quite different," columnist James Reston opined. "'The new frontier of which I speak,' he said, 'is not a set of promises; it is a set of challenges. It sums up not what I intend to offer the American people, but what I intend to ask of them.' "
Typed Manuscript, with autograph additions and deletions, headed "The New Frontier" and being JFK's speech at the 1960 Democratic National Convention, accepting the party's nomination for President of the United States (known as “The New Frontier Speech.”); 20 pages, quarto, no place [Los Angeles], no date [July 15, 1960.] In large typescript - a reading copy - it is missing, apparently, one or two pages, when compared to the published, and televised, speech. Exceptionally rare. Major lines on "New Frontier" appear on pages 14-17.